Inflation has been a hot topic in the UK since October 2009 when it broke free of the Bank of England’s target of 2% and starting soaring towards 5%. This week has seen an intense media focus on the issue, with stories highlighting CPI’s rise to 4.4% in July, regulated rail fares increasing by an average of 8%, hikes in gas and electricity prices of up to 19 and 16 per cent respectively and food prices racing ahead of inflation. With the majority of earners facing a year of wage freezes or salary reductions, and unemployment rates increasing again, many people face difficult choices on what to sacrifice and how to economise. But is this recent period of inflation historically significant? It is certainly anomalous compared to recent years. Inflation last breached 4% in 1992 and stayed well below 3% until 2009. The rate was so benign that concerns over deflation were raised when CPI hit 0.8% in 2000. This was the calm after a decidedly volatile 30 years starting in 1961. Inflation began a relentless rise in the sixties and became a major economic issue in the seventies, peaking at 24.2% in 1975. Between 1974 and 1981 inflation stayed firmly in double digits (with the sole exception of 1978’s calmer 8.3%), reaching 18% as late as 1981. · prices increased by 50% over the course of the Second World War – the rigours of rationing dampening inflationary pressures. But, whilst Britain has endured a choppy history on prices, it has never come close to the turbulence and destruction of hyperinflation. Hyperinflation is defined as extreme or excessive inflation, and is understood by most economists to mean inflation at a rate of over 50 per cent per month (roughly, prices doubling every two months). When hyperinflation is mentioned Weimar Germany springs to mind as the most extreme example of hyperinflation. 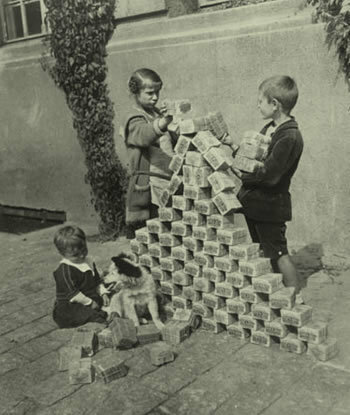 This period produced the classic images of children playing with worthless blocks of banknotes, wheelbarrows being used to take enough money for a loaf of bread and people being paid twice daily to ensure they could buy something with their wages. In December 1923, prices in Germany were more than 85,000,000,000% higher than a year earlier and the highest denomination bank notes had a face value of more than 1,000,000,000,000 marks. But this isn’t enough to earn it the title of highest ever recorded inflation. 1. Hungary, 1946 – highest monthly inflation of 13,600,000,000,000,000% with prices doubling every 15.6 hours. The response was to print a one hundred quintillion pengo note (20 zeroes) and, eventually, to scrap the pengo and replace it with the still extant florint. 2. Zimbabwe, November 2008 – highest monthly inflation of 79,600,000,000% with prices doubling every 24.7 hours. 3. Yugoslavia, January 1994 – highest monthly inflation of 313,000,000% with prices doubling every 1.4 days. 5. Greece, October 1944 – highest monthly inflation of 13,800% with prices doubling every 4.3 days.